Obituary – Hayton, Betty Lorraine (Hay) « Perry High School Alumni Association, Inc.
Betty Lorraine Hay Hayton, 82, of Billings, Oklahoma, was the daughter of David Hofmann and Verda Ellen Hayward Hay. She was born on August 18, 1927 in Shawnee, Oklahoma and died Saturday, October 10, 2009 at the Integris Bass Baptist Health Center in Enid, Oklahoma. 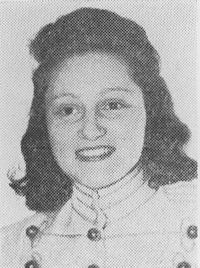 Betty attended school in Lucien and was a 1945 graduate of Perry High School, where she was a 1943 Football Queen Attendant and the 1942-1943 Band Queen. Betty received her Bachelor of Science Degree in Home Economics from Oklahoma A M in 1949. She was a member of the Kappa Alpha Theta Sorority, Beta Zeta Chapter. On May 26, 1950, Betty married Billy Gordon Hayton at the First Presbyterian Church in Perry, Oklahoma. He preceded her in death on January 30, 1995. Betty taught school from 1949-1950 in Conway Springs, Kansas and then taught from 1969 until 1988 in the public school system in Billings, Oklahoma. She was past president of the Billings Chamber of Commerce, chairman of the Billings Wheat Country Festival, member of the Noble County Republican Women and the Billings Historical Society. Betty was selected the 1987-1988 Billings Teacher of the Year, was chosen Billings Citizen of the Year in 1997 and also was the 2008-2009 Noble County Republican Woman of the year. She served as an officer in the Billings Walk through History and was an original member of the Bellmon Belles. She was an active member of the Billings Association of Classroom Teachers, Noble County Rural Teacher Association, Oklahoma Education Association, National Education Association and was the chairperson for the Billings Academic Achievement Banquet. Betty was a member of the Billings Christian Church. Funeral services will be 2:00 p.m. Tuesday, October 13, 2009 at the Billings Christian Church. Kent Reubell will officiate. Interment will be in Union Cemetery in Billings. Services are under the direction of Dugger Funeral Home in Billings. Memorials may be made to the Billings Christian Church, Renfrow-Miller Museum, Bellmon Library or the Billings Union Cemetery in care of Dugger Funeral Home, P.O. Box 41, Billings, Oklahoma 74630. Betty is survived by one son, David Gordon Hayton and his wife, Debbie, of Billings, Oklahoma; one daughter, Lindy Hayton Combrink and her husband, Gary, of Enid, Oklahoma; six grandchildren, Lance Combrink and his wife Allison, of The Woodlands, Texas, Stephanie Kendrick and her husband, Casey, of Stillwater, Oklahoma, Jamie Stinchcomb and her husband, Larry, of Guthrie, Oklahoma, Brooke Tidwell and her husband, Trent, of Stuart, Oklahoma, Haley Hayton of Billings, Oklahoma and Jill Kahn and her husband, Mike, of Oklahoma City, Oklahoma and seven great-grandchildren, Mason Combrink, Jack Combrink and Alexa Combrink, all of The Woodlands, Texas, Riley Kahn of Oklahoma City, Oklahoma, Talon Kendrick of Stillwater, Oklahoma, Teagan Tidwell of Stuart, Oklahoma and Lauren Stinchcomb of Guthrie, Oklahoma.